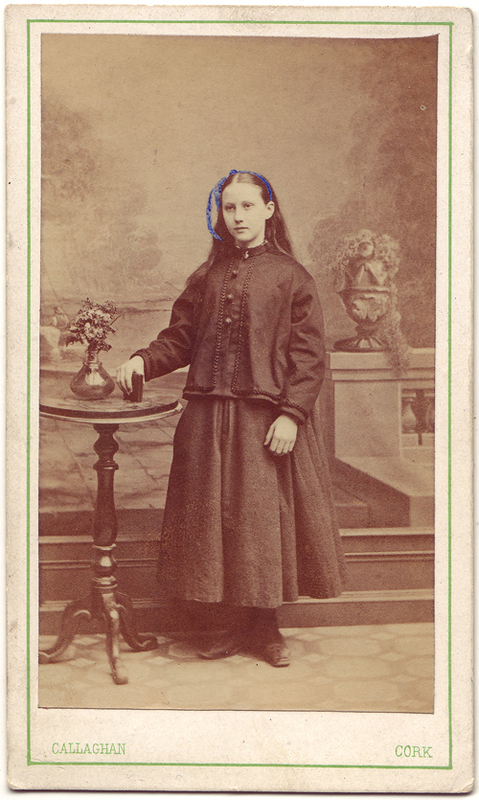 This beautiful carte-de-visite was produced by Callaghan, 45 South Mall, Cork ca. 1870. The photographer first appears in the 1867 General Directory of Cork published by Henry & Coghlan. He is listed again in Slater’s Directory for 1870, in Fulton’s City Directory for 1871 and Guy’s Directory for 1875. Indeed, the directories are confusing in that some years he is listed as Timothy or T.J. O’Callaghan and in others as Callaghan without the ‘O’. I was delighted to come across a reference to the photographer in the Journal of the Cork Historical and Archaeological Society from 1936. The title of the article Timothy O’Callaghan, a Cork lithographer, who printed the prayer book in Irish written by Pól Ó Longán promised much, however, when I called it up in the National Library of Ireland it was only a small note asking the readers if they knew anything about O’Callaghan! I love hand-coloured photographs and wonder if this one was painted in the studio or at home by an amateur? 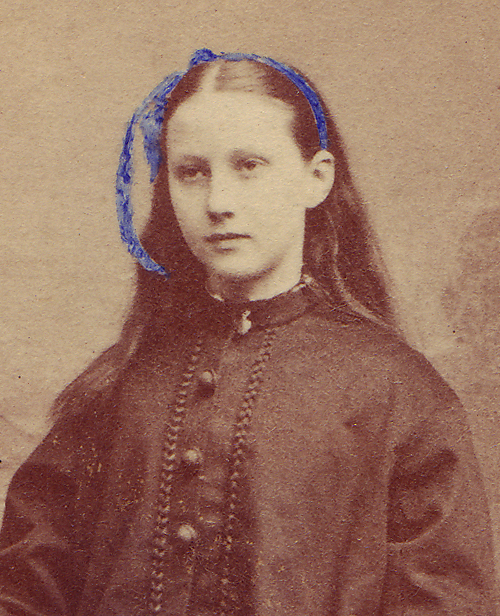 During this period, hand-tinting photographs was a popular hobby and tips were given in women’s magazines and journals. In 1871 the Queen’s Institute for the Training and Employment of Educated Women in Molesworth Street, Dublin offered instruction in the hand-tinting of photographs. This course was taken up by young ‘gentlewomen’ hoping to secure a job with one of the many photographers in the city. I like the fact that the painter has highlighted, in blue, only the small detail of the ribbon tying the girl’s hair. The young girl is wearing a loose-fitting paletot jacket piped with braid. The dropped shoulder sleeves are loose and the collar is in a Mandarian style. The three-buttoned jacket is worn with a wide skirt made from a rough woollen material. The painted backdrop depicts a terrace looking out on a typical pastoral scene. The studio accessories include a lustre wear vase and a small book which is held by the girl as a prop. She’s lovely, isn’t she? Even with the rather severe hairstyle. Would love to see a photo of her in a few years grown up.. I wonder if wearing a ribbon of this colour was a big treat for the girl. The photo seems to be a memorial to the ribbon!